This is probably THE BEST lecture of 2009. 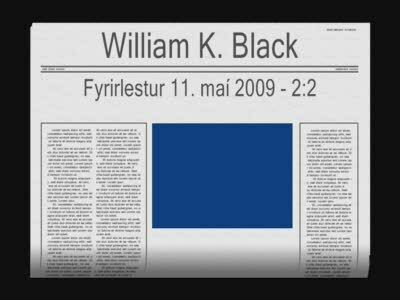 William Black lecture is the paradigm shift we've been looking for in order to decode and unravel the premeditated fraud that's been perpetrated upon us by the white collar criminals. Old economic theories from college are worthless because they do not take into account fraud. Economics needs a way to recognize fraud patterns and taken them into consideration in the valuation of a firm. Control fraud is where the executive at top, such as the CEO, takes advantange of a respectible firm's name in order to perpectuate fraud in an environment where fraud is not as readily suspect. The CEO will optimize the firm for his personal gain from the fraud. Assets that don't have a clear value are great vehicles for accounting fraud, wherein, they are used to easily inflate values. With fraud, the quickest way to make a buck is to grow quickly. It is bad money that drives out good money. Gresham’s law - As a merchant, Greshman quickly came to understand that ‘bad money drives out good’ which is the basis of ‘Gresham’s law. I call this melimine economics. Rememeber that milk in China? The fraudulent melimine milk drove out legitimate competitiors providing a honest product. This is why fraud and criminality is so bad folks!!! Bush destroyed America's systems capacity which is where regulators don't have ability or will to crack down on fraud as it develops. We need to change. The public needs to stop nuetralization. That is the rationalization of fraudulent activities and not believing there was any criminal activity that occured. The excuses are such as: white collar crime is not real crime, the executives meant well, the executives went a bit overboard, it hard to conceptualize and treat them as criminals. The stereotype of a criminal is they dress badly and are involved low level crime such as stealing from the local department store. Remember folks, the white collar crooks of 2000s thought this one all the way though. Like Bush, they committed the crimes because they thought they were immune and would get away with it. CLICK THE LINKS BELOW TO BE FORWARDED TO THE VIDEO PAGES. I had trouble starting the videos. Click in the video's main screen to start the video and wait a bit.